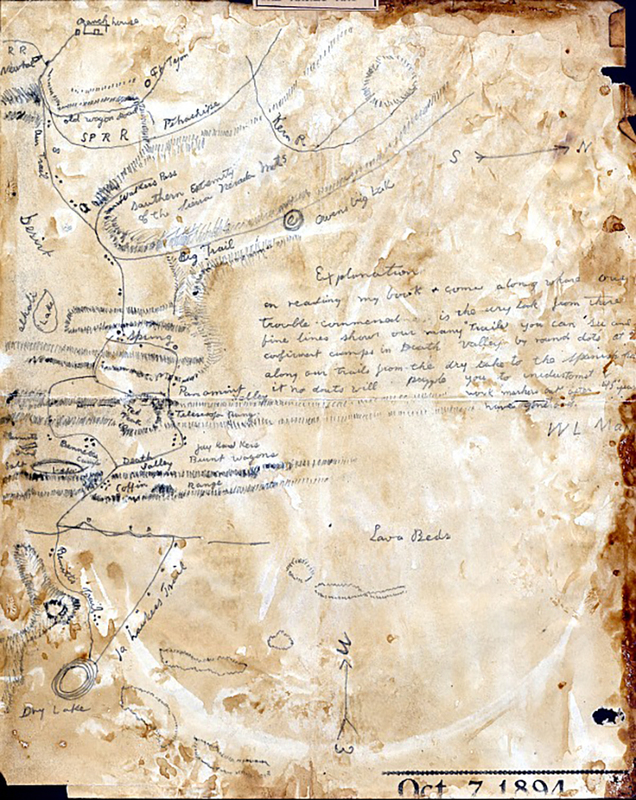 Map drawn in pencil by William Lewis Manly, probably in 1894, when he published "Death Valley in '49." Manly died in 1903 in San Jose. As noted, north is to the right; west, and the Del Valle ranch home (where the 29-year-old Manly and John Rogers, 22, found salvation for the Bennett-Arcan Party on Jan. 1, 1850), are at top. Explanation: On reading my book & come along where our trouble commenced ... is the (?) look from there / fine lines show our many trails / you can see and (?) camps in Death Valley by round dots at (?) along our trails from the dry lake to the Spanish (house?) / it no doubts will puzzle you to (?) work [the] markers out after 45 years have gone by.